Material: high quality paper cards. Ribbon and cards come separately. Perfect for both outdoor and indoor. Easily displayed using the eyelets at either end. Lightweight, portable and environmental. Can be reused. While you’re showering the bride-to-be with gifts and edible goodies, be sure to decorate your venue to fit the occasion. 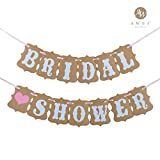 The “Bridal Shower” Banner is an easy way to dress up any room. Available in two styles, this paper banner is easy to hang virtually anywhere for instant style. This entry was posted in Wedding Store and tagged Aniversary, AWEI, Banner, Bridal, Bunting, Cardboard, Engagement, Party, Shower, Wedding by Formal Affair. Bookmark the permalink.